Had to happen. After Indian Motorcycle’s two full seasons of utter supremacy in the 2017-18 American Flat Track (AFT) racing seasons on its return to competition after a 70-year absence – in which its FTR 750 race bike has earned the No. 1 plate in successive years, winning 17 of the 18 races held in the 2018 AFT season – America’s oldest motorcycle manufacturer has almost predictably now launched a street spinoff of that title-winning racer. 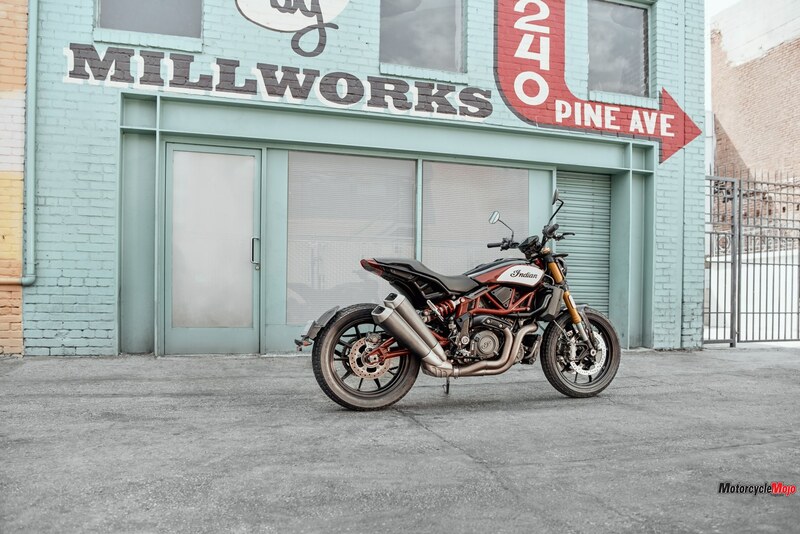 Clearly inspired by the FTR 750 in terms of both styling and engineering, the base model 2019 FTR 1200 (costing $15,999) and the FTR 1200S (from $18,499, depending on colours chosen) broke cover at Germany’s Intermot Show last October and will inevitably usher in a series of Street Trackers from several other manufacturers. Okay, Harley already tried to do it once before with the relatively short-lived XR1200 back in 2008, but nothing since. 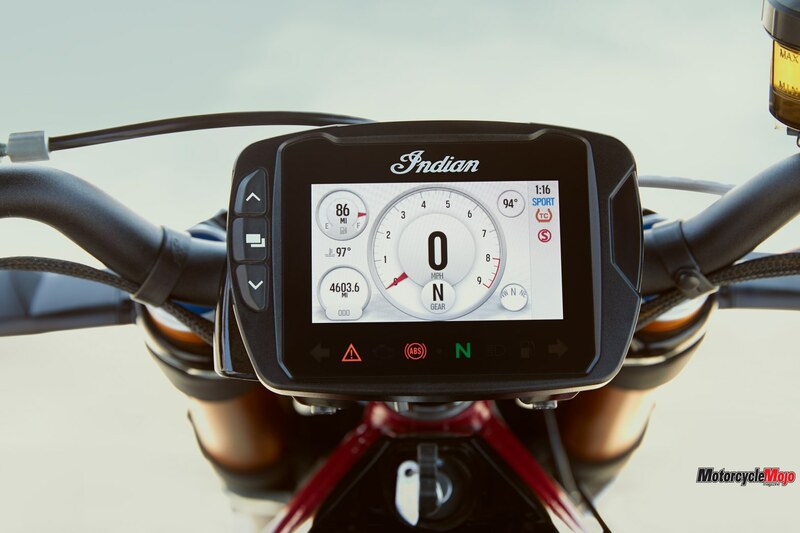 Fuelled by its racing sister’s two seasons of dirt-track dominance, the tag line that the new Indian was “Born on the dirt, built for the street” rings true when you ride it. 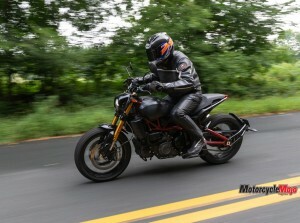 The FTR 1200 and 1200S are the real deal, and a visit to the Minneapolis headquarters of Indian’s parent company, Polaris Corp., for an exclusive ride on the pre-production prototypes on the roads of Minnesota and Indian’s R&D centre’s test track six weeks before their Intermot launch revealed these to be only the first of several future Indian models to be powered by the FTR’s all-new liquid-cooled, 1,203 cc V-twin engine. Delivering a claimed 120 hp at 8,250 rpm with 85 ft-lb of torque peaking at 6,000 rpm, this third Indian engine platform under Polaris ownership following on from the Chief and Scout shares little beyond a general overall format with the Scout motor, which it’ll inevitably be compared to, Indian CEO Steve Menneto says. So while rather ironically this all-new engine is making its debut mounted in something as quintessentially American as popcorn, baseball and apple pie, its future will see it powering models aimed at a world audience, with an adventure tourer to rival the BMW R1250GS likely to be up next, then maybe a streetfighter or sport tourer – take your pick. 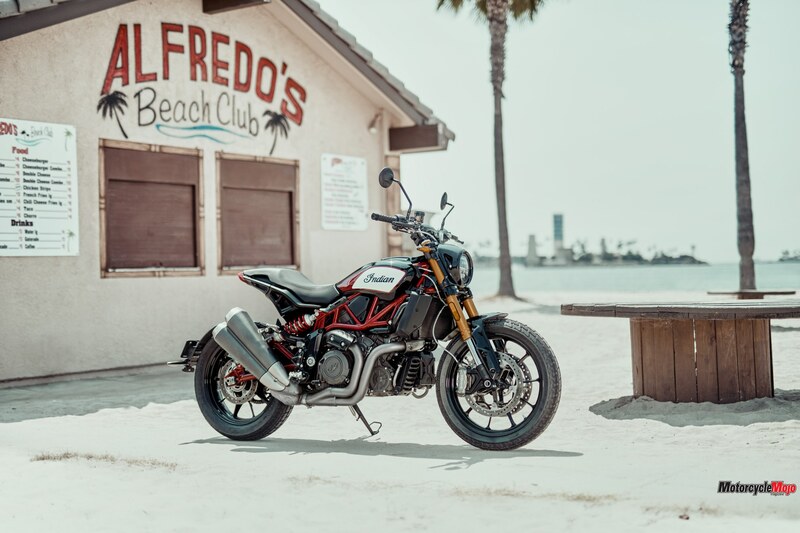 To realize their vision of Indian becoming a global brand, not merely a producer of modern American-style V-twin motorcycles of various types, however excellent, Menneto and his colleagues on the Polaris board are counting on this engine as the platform they’ll use to achieve this. 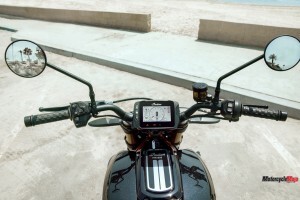 According to Indian’s senior international product manager, Ben Lindaman, work on the new FTR 1200 street platform began in March 2016 – under the code name Project Apollo – only two months after development kicked off on the FTR 750 race bike, so the two projects were essentially linked from the very start. 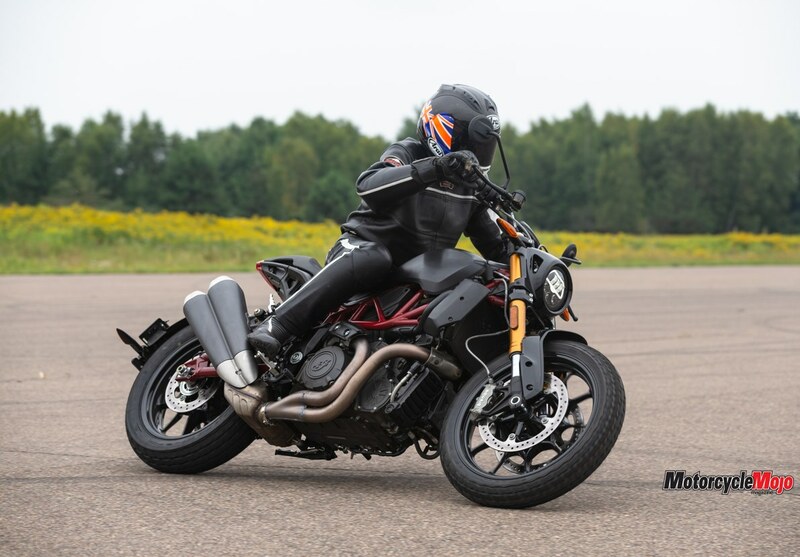 In the past two and a half years, the FTR 1200 has already undergone more than 1.6 million kilometres of simulated ride testing on a trio of MTS four-poster test rigs, and tens of thousands of actual test kilometres on the street. As a joint venture between the massive Polaris R&D centre and Polaris subsidiary Swissauto (purchased in February 2010), which entirely developed the FTR 750 racer from scratch in its Burgdorf, Switzerland, HQ, many of those kilometres were carried out by Swissauto’s test rider, Spanish former 500 GP racer Juan Bautista Borja, as well as Indian Motorcycle’s championship-winning Wrecking Crew AFT race team. It has good heritage. 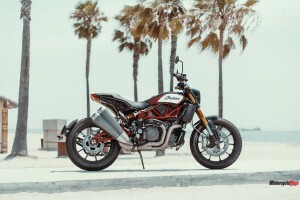 The FTR 1200 features a tubular steel trellis frame in which the engine is mounted as a fully stressed chassis component, with an aluminum rear sub-frame and a fairly long, tubular swingarm that pivots in the crankcases and operates a side-mounted Sachs monoshock (fully adjustable on the 1200S). Climbing aboard the tall 840 mm-high dual seat – though there’s precious little room on it for a passenger – reveals an upright but very commanding riding stance. 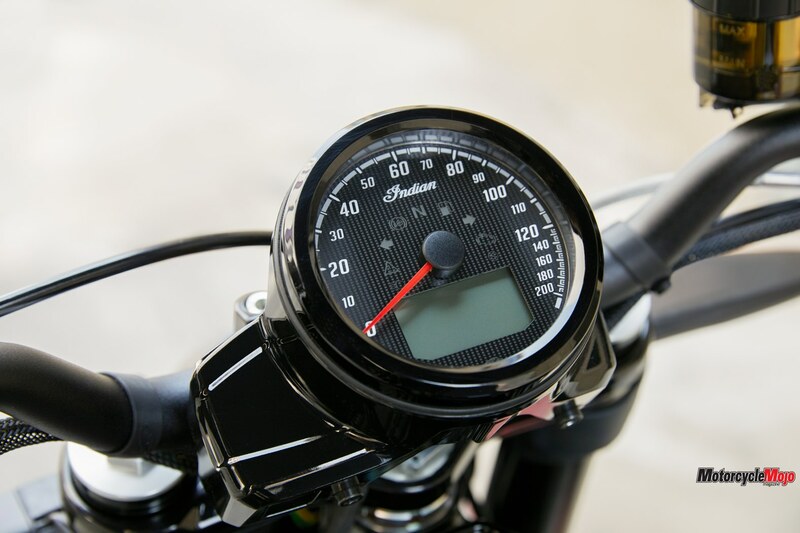 You feel positioned quite far forward on the bike, which helps to load up the front wheel with your body weight with very little sense of weight on your arms. It’s a really untiring stance, even when you start riding hard with the wide, flat, one-piece taper-section, flat-track-styled ProTaper aluminum handlebar delivering good ergonomics and lots of leverage. Sachs upside-down fork is set at a 26.3-degree rake, with 130 mm of trail – and long 1,524 mm wheelbase. 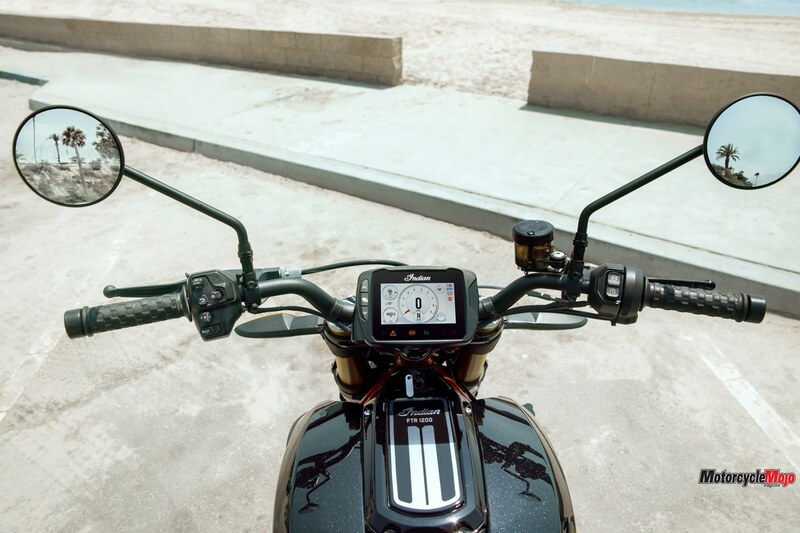 The footrests are set farther back than I’d expected, but the result is a distinctive and pretty comfortable riding position, with a great view ahead over traffic – expect this Indian to rival the Ducati Monster 1200 as the commuter of choice for those in a hurry. 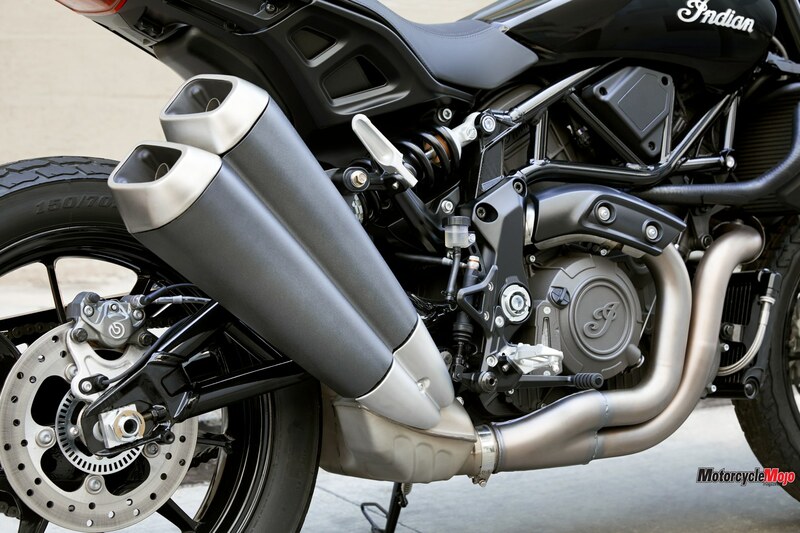 But thumb the starter, and get ready to be transported back in time from the offbeat lilt issuing through the flat-track-inspired 2-1-2 stainless steel exhaust’s stacked silencers on the right side of the bike. 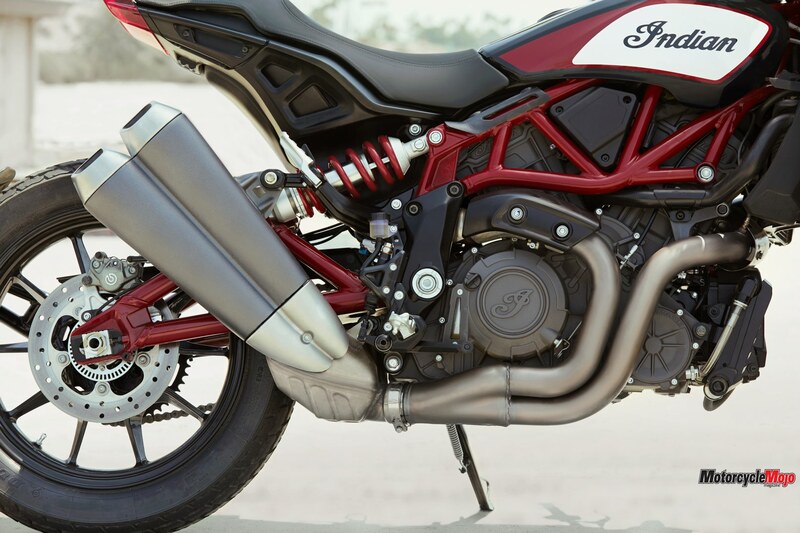 In order to have an airbox with enough volume, Indian moved the 13-litre fuel tank from its traditional perch rearward to beneath the seat, which not only lowers the centre of gravity and delivers increased space for the airbox to be positioned directly above the twin 60 mm Mikuni throttle bodies, but also helps centralize the mass of the bike, in pursuit of more agile handling and easier steering. 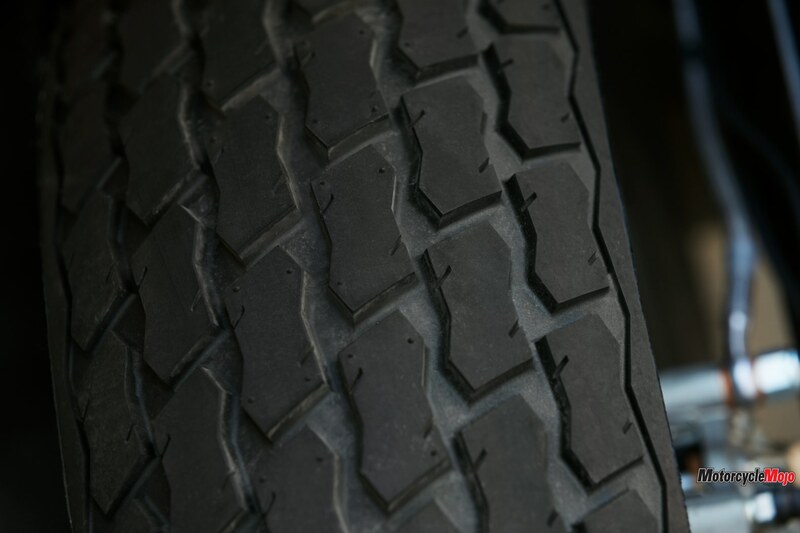 That it does – but at the expense of some notable tire noise from the blocky tread pattern when running on the highway, as well as a distinctive handling characteristic that acts as an early warning system. The flat profile of the 150/80-18 rear Dunlop makes the FTR super stable in cornering action, at the risk of running off the edge of the tire. 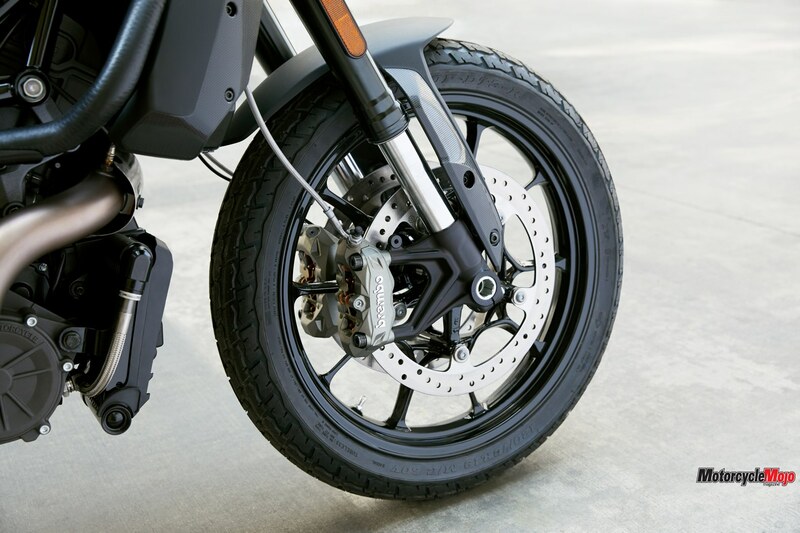 With a 43-degree lean angle before anything touches down, the FTR has much more ground clearance than has the Scout Bobber, and is enough to give you the feeling that the tire is talking to you as you near the edge of the tread pattern when cornering hard in slower bends, as the tread blocks definitely seem to start squirming. 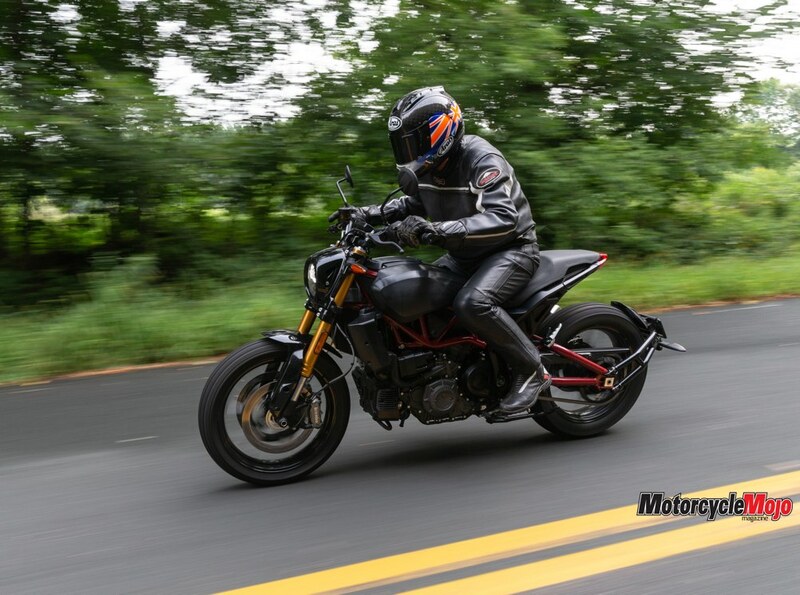 In faster turns, the FTR feels very reassuring and totally planted without that conservative geometry heavying up the steering unduly, and the handlebar doesn’t wobble even slightly in your hands, as some fast naked bikes do with imperfect steering geometry. But in fast 120 km/h sweeping turns, I noticed it was always better to go back a gear to fifth, and drive through these on at least part throttle, so as to make the Indian hug the line without ever washing out the front wheel. 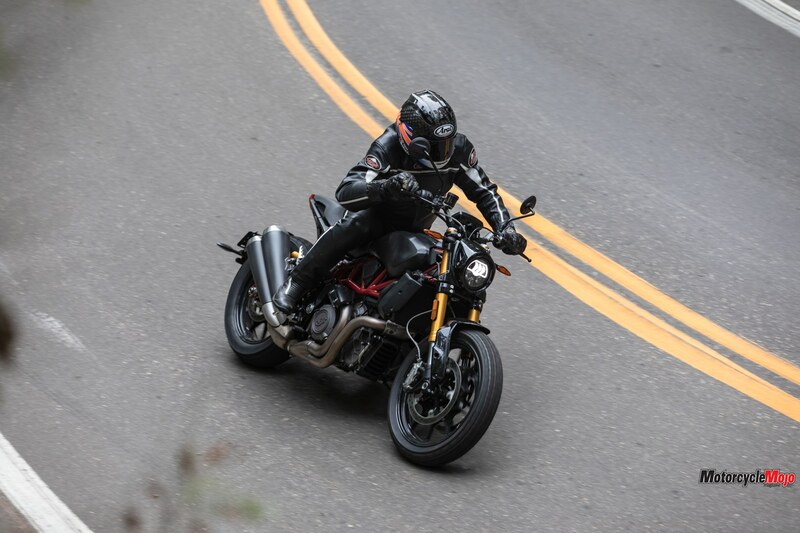 And you can indeed use that wide handlebar to hustle the FTR 1200 through a series of tighter, slower corners both quickly and safely – oh, and entertainingly, too. Señor Borja did his job very well, and he and his test colleagues really dialled in the Sachs suspension excellently, with a massive 150 mm of wheel travel at either end, which you’re very aware of over bumpy back roads, especially via the compliant cantilever rear shock. Yet despite that, there’s no sense of pitching back and forth, even under heavy braking or hard acceleration. Indian and Sachs have together produced a very well balanced motorcycle, where either end of the bike works in harmony with the other. 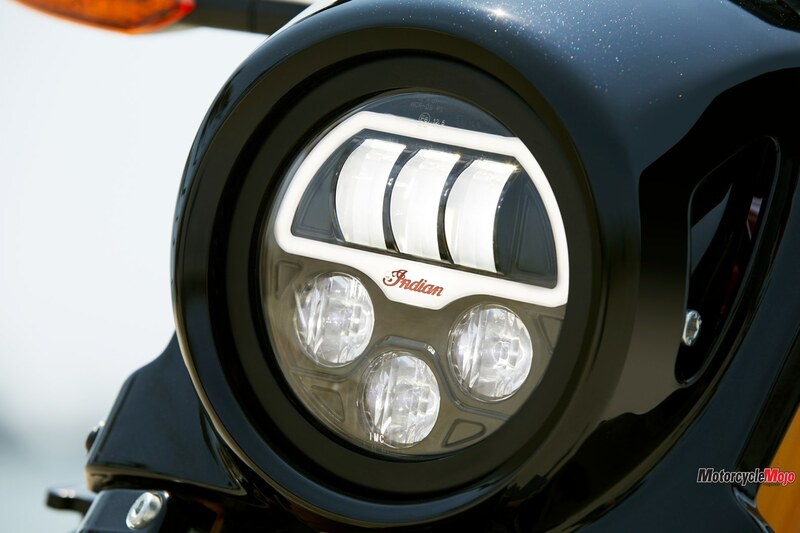 Coupled with the centralized mass delivered by the architecture of the bike as a whole, the Indian changes direction effortlessly – it’s a really nice-handling package.